Today is the fourth anniversary of our blog. Over the next year we plan to incorporate some changes to our site. The first change has already happened … we've switched to our own domain name! You can now find our blog at postilius.com. Postilius started as a place for us to document and share our transition into parenthood. We covered Ezra’s gestation and birth and since then, we’ve covered a little bit of everything else along the way. We’re discovering that parenting itself is a dynamic process and this blog has been a valuable and retrospective place for us to formulate (and sometimes rethink) our ideas, share our observations, and capture our memories. We’re not certain where Postilius will be in a year, but we have a few goals. First, we plan to post regularly. We will continue to write about what is currently happening in our life as well as filling in some of the gaps created from posting so little last year. Second, we hope to become more a part of the blogging community. We are looking forward to finding the time to read and comment on more blogs, and interacting with other bloggers. So, send us some suggestions on your favorite blogs or share a link to your own blog. Third, we’re tweaking the look of our blog so expect some visual changes in the next few weeks and months. A friend of mine recently discussed her resolutions for 2013 on her blog and follows a simple, yet genius, schema of setting very general goals instead of specific resolutions. For example, rather than resolving to lose 15 pounds, one resolves to “lose some weight.” I like setting goals, but I’ve never found New Year’s resolutions useful in a meaningful way, and it’s been quite a while since I set some personal goals for myself so I’m pretty excited about her idea. I think it will be motivating without feeling like I’m punishing myself if I fail to meet them. We’ll see how it works out for me. More exercise. This includes yoga, indoor cycling and hiking on a more regular basis. This goal is closely tied with a desire (and the need) to lose weight and be healthier. I don’t feel like I can go into weight loss goals without sounding like Bridget Jones Diary, so I’ll just leave it at “more exercise” for your sake. More sewing. I’ve sewn very little in the last few years and nothing at all last year. Surely, I can sew at least one thing this year, though ultimately I would like to sew more frequently than that. More self-care. This could end up being a little bit of everything. It includes small things like reinstating my nail routine (my nails and cuticles look like crap) and other personal maintenance. It also includes bigger maintenance, like going to the dentist and doctor. Perhaps, I’ll start by trying to stop picking at my damn fingers. That would be a really good place to start. More blogging. We only had 5 posts in 2012. We’d like to write more this year, and Garry has us off to a good start. Maybe it started with a milk mustache? Something sparked a mustache obsession with Ezra. I know he is not alone. Mustaches, or at least fake mustaches, seem to be everywhere. But, I don't think that is the source of Ezra's interest. He is not that exposed to popular culture, and I have never caught him browsing Etsy or Pinterest on our laptop. I don't think he realizes mustaches are trendy. He just wants one. He is often seen trying on different styles. 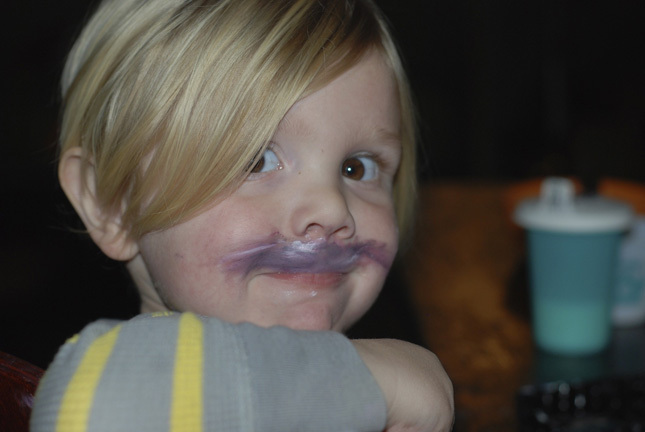 Sometimes he wears a mustache of the do-it-yourself with face paint or marker variety. Other times, he turns a random objects into mustaches of various sizes. "Look! I have a mustache!" he will exclaim while holding a pencil below his nose. Ezra is definitely enamored with mustaches as much as any hipster, but Ezra's passion seems sincere. The mustache trend mocks the idea of growing a mustache. The trend says, "mustaches are absurd. Look, a picture of a pug with a mustache! Ha, ha, ha. Look, I'm pretending to have a handlebar mustache! Ha, ha, ha." Ezra is funny and enjoys making people laugh, but in this case I don't think his mustaches are jokes. I think Ezra genuinely would like to grow a mustache. Maybe, someday he will succeed in making mustaches cool and un-ironic again. I hope this includes a starring role in a reboot of the classic 1980s T.V. 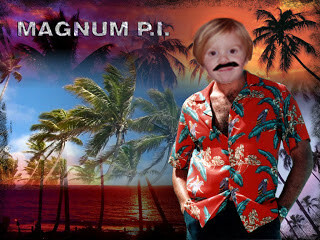 series Magnum, P.I. Ezra has a big personality. He is loud, talkative, excitable, funny, and animated. He is typical of the members Amanda and I have added to our family. The oldest, Grace, is the noisiest cat I have ever met. She is outgoing and loves meeting strangers to the point of actually sitting in our window yelling at pedestrians in an attempt to bring them over for a chat. She is also opinionated and effectively bossy in spite of not speaking our language. As a kitten she clearly directed how we should play. “No move the fake mouse more in a circle, then to the left.” Piper, the youngest of our pets, is a loyal and happy dog that is too large to ignore. He needs at least a couple of walks a day, and his long, thick coat of black fur always needs more brushing. Like Grace and Ezra, he also wants to be with us at all times. Stella, our middle pet, is the odd ball of the household. She is affectionate, but shy. She is independent, neat, tentative, and likes routine. In a previous life she was probably a happy spinster who, ironically, spent most of her time with her cat. In this life, we named her Stella Marie after the P.J. Harvey song O Stella. We hoped the chorus, “Stella Marie you're my star,” would boost her confidence, but at the same time enjoyed her less dramatic personality. In fact, I always felt her temperament was much closer to Amanda’s and mine. I relate to her introversion, appreciate her tidiness, and understand her frequent frustrations with Grace. Unfortunately, the traits that have made Stella our family’s easiest pet, also made her the easiest to overlook. Attending to Ezra’s, Piper’s and Grace’s demands and needs, Amanda and I neglected to notice how much Stella also needed us. In late May of 2011 we took Stella to our vet after realizing how skinny and lethargic she had become over a short period of time. The doctor suspected she was suffering from a thyroid disorder, kidney failure or diabetes, and we were slightly relieved when tests showed her glucose levels were much, much higher than normal. Diabetes, unlike kidney failure, could be treated. We began weekly trips to the vet to have her glucose levels checked and her insulin dosage adjusted accordingly. She eventually began to regain weight and strength. She also began to spend more time physically around us. Her brush with death was a reminder, to both Stella and us, of the importance of being with family. We continued giving Stella insulin injections twice a day. Her glucose levels mostly stabilized, but still varied more than was healthy. 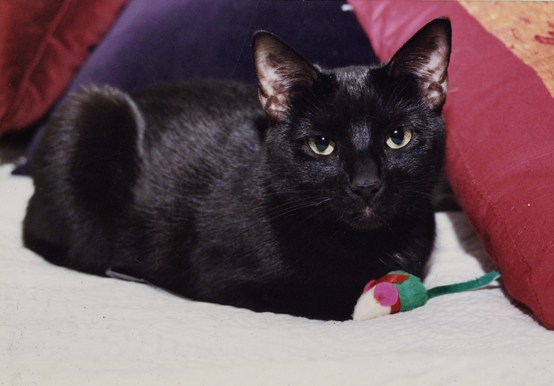 The levels often seemed to spike when she experienced stress, like doctor visits, but for almost a year she was a happy and mostly healthy cat. In early May of 2012 Stella once again stopped eating. This time we noticed right away, but she was deteriorating faster than before. 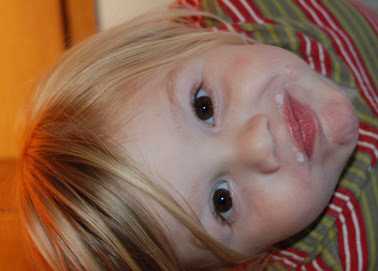 We hand fed her until she was no longer strong enough to eat from a spoon, and then we fed her with a medicine dropper. Within a few days, she began having seizures caused by mini-strokes, and our fear was becoming reality. She was not going to get better this time. Stella’s last night was spent at an emergency veterinary clinic in an attempt to stabilize her – to stop the seizures and help her to rehydrate and regain strength. An I.V. helped recover her strength and with it her awareness of her surroundings, but the strokes continued and no reasonable course of action was going to stop them. They had already caused paralysis in her back legs and blindness. Being an emergency clinic, the vet’s office was very practiced and prepared to help families deal with the loss of their animal friends. Once Amanda and I decided Stella’s life was coming to an end and we needed to help her through this process as painlessly as possible, we were walked down the hall to a special room. Unlike the clear glass that framed the examination room doors, this wood door was surrounded with frosted panels for privacy. Though the people in the identical room across the hall could only be seen as shadows, the sounds of their sadness were clear. These rooms were designed for a single purpose, saying goodbye. Amanda and I sat silently, waiting for Stella to join us on the small couch we were sharing. When she was brought into the room, her alertness made the time we spent with her both easier and more difficult. Lying on my lap purring, it was easy to forget her body’s betrayal, and question if we were making the right decision. Maybe she could spend more time with us? Then, she would try and move or another seizure would begin, and we were reminded why this was the choice that had to made. The vet let us spend as much time with her as we wished, and then, as she was curled on my lap, they administered the poisons that ended her life. Nothing seemed to change. I could easily convince myself she was asleep in a cozy ball on my legs just as she has been hundreds of times over the past 11 years. This illusion quickly faded as the technician picked up Stella’s limp form, her empty body, and took her away. We still miss having Stella as a part of our household. Ezra continued to talk about having two cats for months after she passed away, pausing and asking, “where’s Stella?” I do not think I ever answered his questions that well. I could never decide what was best to tell him and what was best to leave out, and erred on the side of vagueness. Therefore, Ezra never grieved the loss of Stella because he never quite understood her death, but he did understand that something about Stella was upsetting Amanda and me. “Are you crying because Stella is sick? It will be okay, Mommy,” he would reassure Amanda. Though his hugs helped, Ezra also lessened my grief in an indirect way. Browsing the children’s section of a bookstore together, I came across a book titled Stella’s Big Wish by Leslie Perrine. Stella, in the book, is a tiny white dwarf star among red giants. Though she never changes in size, a boy discovers “from where he was standing she was the brightest, biggest star in the sky.” The book felt less like a children’s book and more like a dream I should have had as it perfectly captured the essence of how I saw Stella. I may have lost “my star” with Stella Marie, but I found solace in the book reminding me the sky is still full of other stars, just like her, awaiting their discovery by the right person.